*Ahem. * Said in our very best Monty Python Cockney accent: "And now for something completely different." The last couple of motorcycles we've reviewed – namely the Ducati Hypermotard 1100 EVO SP and Aprilia Dorsoduro – have been V-twin powered machines with horsepower figures that flirt with three digits and top speeds well over The Ton. Either of these bikes can quite easily loft the front wheel (or the rear, if that sort of thing is your bag, baby), burn up the drive rubber with reckless abandon or grind their hard bits into oblivion with the kinds of ludicrous lean angles that are normally seen only at weekend MotoGP races. However, today's review is most definitely not that kind of bike. In fact, you might say it's diametrically opposed to either of the aforementioned pavement pounders. The subject of this test is the brand-new-for-2010 Royal Enfield G5 Classic, and the question that was on our minds when we first laid our eyes and sweaty palms on the machine was this: Is it possible that a classically styled, low-horsepower, single-cylinder motorcycle that traces its heritage way back to the 1950s can be as fun to ride as a much more powerful, fully modern and well-equipped model? Read on, friends. In a word, Yes. And... no. Confused? Perhaps all will become clear in a few moments. First, let's take our usual walkaround. What we have here is a rather unique specimen in the motorcycling world. With its tall, spindly front and rear spoked wheels, long and thin pleated saddle and single large round headlight, there is simply no mistaking the Royal Enfield for anything but a retro motorcycle design. Only it isn't a retro motorcycle design. To be retro, a machine needs to purposely mimic classic designs from the past, and the 2010 Royal Enfield G5 Classic is doing no such thing. 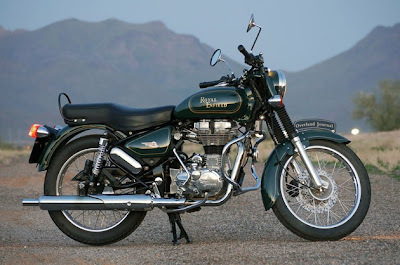 In fact, the entire Royal Enfield lineup, which also includes a G5 Deluxe with a more healthy spattering of chrome, can directly trace its roots all the way back to 1955, when the Indian military decided that the Enfield Bullet would be the perfect machine for use by its army and police units as a suitable method of transportation. 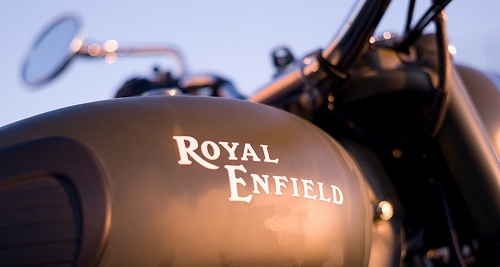 Shortly thereafter, the original British manufacturer folded, closed up shop and sold all the rest of the tooling and the rights to the motorcycle design to the new manufacturer in India. From that date until 2009, very little changed – the 350 and 500cc air-cooled, single-cylinder Royal Enfield Bullet enjoyed a run of continuous production in India from 1955 all the way until just last year. In case you were wondering, that earned the Bullet the distinction of the longest production run in the history of motorcycles. Impressive, no? All of that changes rather drastically for 2010. Now we have an entirely new unit-constructed engine and five-speed gearbox. The reason for the change? Emissions. Put simply, it was impossible for the Indian motorcycle manufacturer to meet today's strict emissions regulations with a powerplant that can trace its origins back to World War II. With so much history at stake, though, it wouldn't be prudent for Enfield to just drop all of the connections it had to the past. So the 2010 revision brings more of the same, with a twist: the G5 still sports an air-cooled, single-cylinder engine that displaces 500cc, but in a nod towards modernity, the new engine is now fuel injected and computer controlled. A closer inspection reveals that the 2010 powerplant shares virtually nothing at all with the previous unit, save for its basic appearance and dimensions. That, friends, is a very good thing. 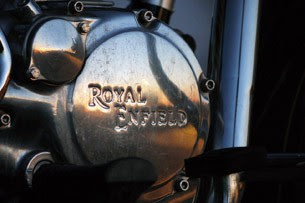 Though there's a rather large contingent of Royal Enfield enthusiasts who surely died a little inside with the introduction of the new fuel-injected powerplant, the rest of us get to enjoy the beauty of reliability wrapped up in a package that is nothing if not distinctive. And it attracts oodles of attention out on the road. 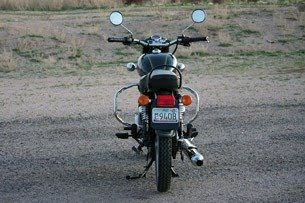 So, what's it like to ride the 2010 Royal Enfield G5? Put simply, it's rather uneventful. And we mean that in the best way possible. Though the previous Bullet had made great strides in quality over the past decade, there was still a constant fear that you were pushing the machine just a bit too far past its inherent limitations while doing nothing more than trying to keep up with the frenetic pace of today's traffic. Now, with the new powerplant, you can wring the little neck of the single, overworked cylinder without fear of an impending seizure. 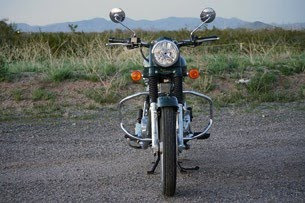 Which is a good thing, 'cause it's a darn near necessity to push the Enfield harder than almost any other motorcycle in America if you truly desire to ride at the current stride of life. We'll put it this way: The terminal velocity of the 2010 Royal Enfield G5 Classic, with our 200 pounds of mass riding atop, of course, is 81 miles per hour. The needle may have swung just a tad bit further to the right with the occasional downhill grade or a swift kick of the wind at our backs, but you certainly shouldn't count on that. The good news, though, is that we found the Enfield surprisingly at peace with that top speed limitation. Sure, the steering is a tad twitchy and overly light, but the engine didn't seem to sweat such merciless pounding in the slightest bit, and the front disc and rear drum brakes weren't fazed when tasked with bringing the speeding Bullet to a halt from its maximum velocity. That said, if you plan on riding for long distances on the freeway with the throttle planted firmly on the stop, you're missing the point entirely. Slow. Down. Or choose another bike. Yes, the G5 Classic, and we suspect also the C5 and Military models, deserve to be enjoyed at a slower pace. While it's good to know that the machine isn't a ticking time bomb at freeway speeds, a more leisurely route will allow you to pick up on the finer points of riding a motorcycle that you may have forgotten all about with the impressive level of sophistication found in today's machinery. 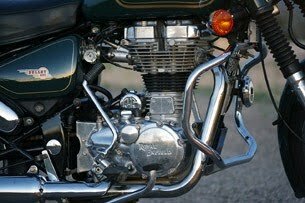 The Enfield feels very mechanical, and planting one one in your garage is likely to lead to more of a relationship with the motorcycle than actual ownership. In the two weeks we spent with the G5, we seemingly learned what the bike likes and we were more than happy to oblige by altering our riding style appropriately. Paradoxically, slowing things down a couple of notches actually made the bike seem faster and more robust. The old saying that it's more fun to ride a slow bike fast than a fast bike slow may never be more apt than with the 2010-and-newer Enfield. When ridden at 7/10s, everything falls into line – the deft handling could be described as flickable, the acceleration is relaxed, but completely acceptable, and the braking performance is admirable. Listening to the beat of the single lung directly below becomes soothing and the vibration you feel through the footpegs becomes little more than a reminder that you are riding a motorcycle. 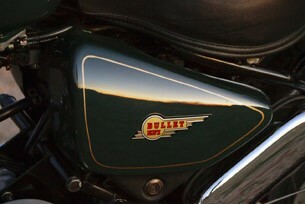 A real motorcycle. It has a reason for being. And you actually have a desire to ride the Enfield within its limits, not because it can't push its boundaries, but rather because it is simply better not to. Perhaps you've noticed that we've neglected to give any real specifications for the Enfield. That was intentional. They really really don't matter, but if you insist... The manufacturer claims about 27 horsepower and 30 pound-feet of torque from the engine, which employs a 90-millimeter stroke coupled with an 84-millimeter bore. Compression sits at 8.5:1 – much higher than the previous engine's 5.5:1 ratio, which surely helps with the ultimate power output. Rake is 27 degrees and trail is very short at 3.2 inches, and that's the figure that most obviously accounts for its light handling at mid-level speeds. 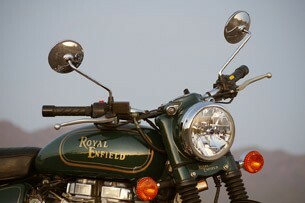 Again, though, poring over the spec sheet is completely useless with the Royal Enfield. 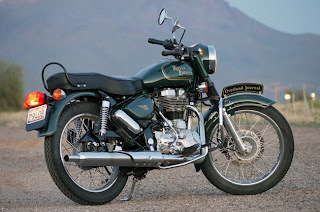 You see, it's simply not possible to compare the Royal Enfield G5 Classic with a motorcycle from today that was designed to excite the senses with every twist of the wrist. And, surprisingly enough, it's all the better for it. As it turns out, something completely different isn't necessarily such a bad thing after all. Actually looks like it might be a solid 1st bike for someone that doesn't want to sell it 2 months after learning to ride.